NRCC - As a swing state in presidential elections, Florida is perpetually in the spotlight for both parties, and this year is no exception. 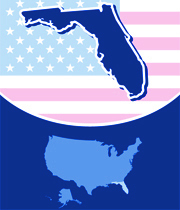 Reapportionment following the 2010 census added two seats to Florida’s House delegation. Through the legislative redistricting process Republicans successfully strengthened a number of GOP held competitive seats and created new seats likely to elect Republicans this November. Democrats will have to answer to a large senior population in Florida that is livid about Democrats’ $716 billion in cuts to Medicare to fund a government takeover of healthcare outside of Medicare. Having President Obama on the top of the ticket will serve as a toxin that may condemn many Democrat challengers to failure in November. Compound this top of the ticket drag to recruitment failures in a number of districts that should be competitive and Florida stands to be another lost opportunity for Democrats in their drive to return Nancy Pelosi to the Speaker’s chair. In 2010, small business owner and fourth generation Panama City resident Steve Southerland knocked off long-time entrenched Democrat incumbent Allen Boyd. Southerland has become known as a conservative champion and is popular with his constituents. Meanwhile, Democrats banked on state Rep. Leonard Bembry as their best chance at knocking off Southerland. Unfortunately for Democrats, Bembry lost to challenger Al Lawson who emerges from a divisive primary with his resources depleted and his image damaged. Entering the general election, Southerland enjoys a more than a 7 to 1 cash on hand advantage over Lawson and is well positioned for success in November. District Facts: PVI R+4,McCain 51.94% Bush 51.48%. This district encompasses the central panhandle including the cities of Tallahassee and Panama City. The Cook Political Report rates this race as Lean Republican. The Rothenberg Political Report rates this race as Lean Republican. Former speaker of the Florida House, Webster has proven that he stands for common sense reforms that have earned him praise from his constituents and community leaders. Webster has proven to be an effective Member of Congress fighting Democrats’ tax-and-spend policies. Always inspired by new ways to solve problems, Webster is dedicated to fiscally responsible practices and getting the economy back on track. National Democrats have wholeheartedly embraced Val Demings as their candidate in this district. Through redistricting, the new 10th District became not only more Republican but exceedingly difficult for Demings to win because her base of support in Orlando was drawn out of the district. In addition to losing her political base, Demings will be saddled with defending her support for President Obama’s government takeover of healthcare which is deeply unpopular in this conservative district. District Facts: PVI R+7, McCain 52.09 %, Bush 57.68 %. The district includes Orlando’s west suburbs of Winter Garden and Leesburg. The Cook Political Report rates this race as Solid Republican. 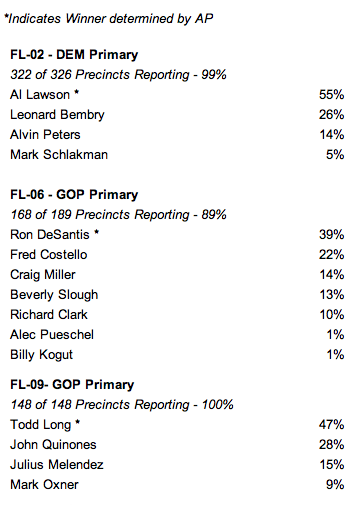 The Rothenberg Political Report rates this race as Republican Favored. District Facts: PVI R+1, Bush 51.34 %. The Cook Political Report rates this race as Likely Republican. The district includes Tampa Bay, the St. Petersburg suburbs, and Clearwater. Bill Young has a significant COH lead with $325,237 while Jessica Ehrlich has only $71,421 COH. Congressman Buchanan’s focus while in Congress has been on promoting the free enterprise system in order to encourage job creation at home. A self-made businessman, Buchanan knows firsthand what it takes to get the economy moving and how to spur job growth. Buchanan has already placed an impressive $3.2 million television ad reservation, already outpacing national Democrats’ investment. With a total disregard for the fundamentals of this race, national Democrats seem to be fixated to expending resources against a well liked, well funded Member of Congress in this strongly Republican district. Buchanan’s opponent, Keith Fitzgerald is a former Florida state representative whose own poll shows Congressman Buchanan leading by double digits. District Facts: RVI R+5, McCain 50.82 %, Bush 54.69 %. This district is comprised of the southwest coast, including Sarasota and Bradenton. The Cook Political Report rates this race as Likely Republican. The Rothenberg Political Report rates this race as a Lean Republican. Vern Buchanan has a solid $1,520,673 COH, more than twice as much as Keith Fitzgerald’s $651,005 COH. With an unbelievable talent to fundraise, Lieutenant Colonel Allen West is a charismatic straight shooter with 22 years of service in the United State Army. In Congress, West has become a champion of protecting the rights of small business owners, voting for 27 different bills to empower them. Democrats have unsuccessfully tried to demonize West and it has only backfired, raising his profile and expanding his grassroots support. A man of the people, Allen West is fearless and ready to fight the establishment in order to do what is right by his coastal Florida constituents. There are many reasons why 29-year-old Patrick Erin Murphy is not seen as a credible challenger. Already Murphy has called West, who is a decorated combat veteran, a coward. Murphy was also arrested after verbally assaulting a law enforcement officer. On the campaign trail Murphy has shown he’s nothing more than a parrot for national Democrats reciting tired talking points and not providing any individual, unique solutions. Murphy’s support for President Obama’s $716 billion in cuts to Medicare will be an anchor that ultimately weighs down his campaign. District Facts: PVI R+1, McCain 48.1 %, Bush 50.53 %, This district includes Port St. Lucie and Jupiter of Florida’s Treasure Coast. The Cook Political Report rates this race as a Toss Up. The Rothenberg Political Report rates this race as a Toss Up/Tilt Republican. Allen West’s war chest is loaded with $3,732,019 COH while Patrick Murphy has less than half that amount with $1,287,887 COH. This new district was carved out of highly Republican territory that makes this a likely GOP pickup this November. Iraq War veteran, attorney and St. Johns County resident Ron DeSantis is a great fit for this district. An eager and popular Republican in his community, DeSantis has caught the attention of Citizens United and the American Conservative Union. Already up with campaign ads in July and with a relatively deep war chest, Ron DeSantis is well positioned for victory in November. District Facts: PVI R+6, McCain 53.45 %, Bush 54.7 %, The Cook Political Report rates this as Solid Republican. This district includes Daytona beach and St. Augustine in the northeastern part of the state. Ron DeSantis has $320,702 COH and Heather Beaven has a puny $47,567 COH. National Democrats’ choice, Alan Grayson, has already been rejected once by Florida voters for U.S. Congress and his reputation as a radical, leftist darling has only gotten more embarrassing over time. In fact, in 2010, an Orlando Sentinel editorial said, “Mr. Grayson’s antics are not merely an embarrassment to himself and his district. They deepen the partisan divide that has left Congress almost dysfunctional.” Now, Grayson is running again on his already-rejected record of voting for his party’s big-government healthcare takeover that guts Medicare and raises taxes and fees by $525 billion. In a district that Bush won in 2004, ex-Congressman Grayson is presented with a host of challenges this time around. Due to him being such a polarizing figure, national Democrats have had to commit precious resources to this race, still not ensuring a win for their party. A refreshing contrast, Todd Long is a small business owner and hosts a conservative radio show that creates a dialogue contesting the growing power of government and offering common sense solutions. District Facts: PVI D+3, Bush 50.84 %. The district includes Orlando’s south suburbs: Kissimmee and St. Cloud. The Cook Political Report rates this race a Toss Up. The Rothenberg Political Report rates this race as a Lean Democrat. When Representative Connie Mack decided to run for the U.S. Senate, Trey Radel stepped in as a strong replacement who represents the true conservative ideals of this district. Radel has had a successful carrerr including being a host on one of Florida’s popular conservative radio talk shows. Recently, Radel and his wife formed a nonprofit for helping injured soldiers. Far from a career politician, Trey Radel wants to restore fiscal order and bring common sense choices back to Washington. District Facts: PVI R+11, McCain 56.76 %, Bush 61.41 %. The Cook Political Report rates this race as Solid Republican. Fort Myers and Naples make up this district on the southwest coast of Florida. Trey Radel has $286,493 COH and James Roach’s joke sum of $5,593 COH. Known for her abrasive personality and uncanny ability to make enemies, Lois Frankel has made a career of wasting taxpayer dollars, from traveling to political fundraisers in a police helicopter to avoid traffic, to spending more than $13,000 in tax dollars on an extravagant marble bathroom for her city hall office that she never even used. It will be a constant uphill battle for Frankel to appeal to voters in this district. District Facts: PVI D+5, This district stretches from West Palm Beach south to Fort Lauderdale along Florida’s eastern coast. The Cook Political Report rates this race as Lean Democrat. The Rothenberg Political Report rates this race as a Lean Democrat. Adam Hasner has $1,012,896 COH at the end of the fundraising quarter and Lois Frankel as $1,362,795 COH. Hasner is the only candidate to place an ad buy in the district and has already attracted the U.S. Chamber and the Young Gun Action Network, who have put money down in the race. 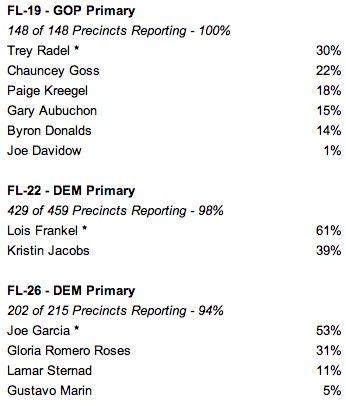 The following are the unofficial results from Tuesday’s primary election in Florida. These results are unofficial and incomplete.